Conference Facilities South Africa has a comprehensive list of conference venues and centres with conference facilities in the Transgariep & Goldfields region of the Free State Province in South Africa. The Transgariep region of the Free State is situated in the southern tip of the Free State with the Orange River forming the natural boundary in the south. This region of the Free State is unspoilt, unpolluted and sparsely populated. The Goldfields region of the Free State was shaped by the discovery of Gold in 1938. Today the Free State goldfields are rivaled only by those of Gauteng. The Goldfields area occupies the northern half of the Transgariep & Goldfields region of the Free State in South Africa. It was in 1938 that gold was first discovered here, causing prospectors and miners to flood into this Free State region. Today only the gold mines of Gauteng rivals those of the Free State goldfields. The Transgariep area occupies the rest of this region in the Free State. The Transgariep region is characterised by vast grassy plains which are fed by the Orange River which rises in the far northeast of Lesotho. The Gariep Dam, which was opened in 1972 and covers 36500 hectares, is situated on the Orange River. The Transgariep & Goldfields region town of Bloemfontein is the Capital of the Free State and the judicial capital of South Africa. Bloemfontein has its origins as far back as 1840 and is home to a great number of museums which are to be found throughout the city. Just outside the city centre of Bloemfontein you will find the Free State National Botanical Garden which is home to more than 400 species of indigenous flora. Welkom, the second largest city in the Free State, is also situated in the Transgariep & Goldfields region. Welkom was planned by the chairman of Anglo-American and is a garden city with a commercial centre built around a central square. The mines in and around Welkom are very deep and flooding of the shafts is an ever-present threat with large quantities of brackish water being pumped to the surface daily. The water is collected in evaporation pans which have become home to a prolific bird life including flamingo, the sacred ibis, Egyptian goose, Muscovy duck, Marsh Owl, and seagulls. Philippolis is the oldest town in the Transgariep and Goldfields region of the Free State. Philippolis was founded in 1823 by the London Missionary Society for the benefit of displaced Khoikhoi and San. Many of the typical Karoo houses in the town have been declared as National Monuments. In the southwest of the Free State province you will find the Kalkfontein Dam Nature Reserve. The reserve is home to one of the few fishing dams in South Africa where yellowfish are plentiful. The reserve is open daily and has become a favourite venue for weekend picnickers, campers and fishermen. 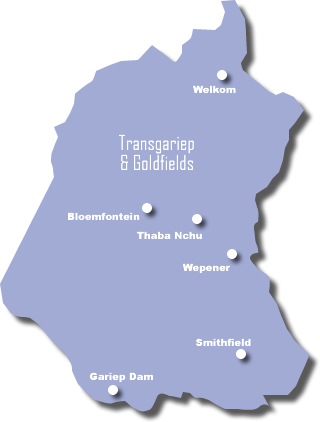 Some of the more prominent towns of the Transgariep and Goldfields region of the Free State include Bloemfontein, Gariep, Philippolis, Smithfield, Thaba Nchu, Welkom and Wepener.